Is there a Screech-Owl in your neighborhood? We live on the border for the range for Eastern Screech-Owls and for Western Screech-Owls. Until 1983, they were thought to be the same species. DNA tests showed they are not. Most Eastern Screech-Owls are browner than their cousin, the Western who is gray to brown in color. The best way to distinguish Eastern from Western Screech-Owl is by sound. Eastern Screech-Owls have a descending whinny that sounds like that of a horse, as well as, a long, whistled trill of one pitch. Western Screech-Owls give an accelerating series of short whistle, like a ball bouncing as it comes to rest. Neither species screeches, but both bark and chuckle. Screech-Owls adapt well to human habitats. Both species can be found in open woodlands, including urban parks and backyards. They eat small rodents, moths, bats, fish, and small songbirds. Both species are about as tall as a robin, but stocky with no neck and ear tufts. Regardless of color, they camouflage well into their surroundings. Screech-owls sometimes perch at the entrance of their roost holes during the day, but they are nearly invisible by pressing their head and body feathers against the tree to blend in. If you have a lot of trees in your neighborhood, you may already have a screech-owl. 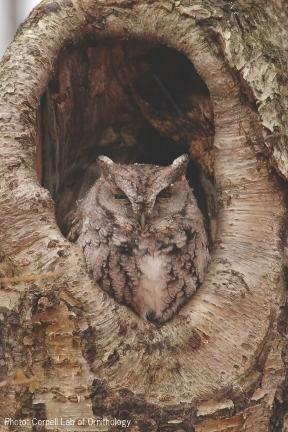 Screech-Owls nest in tree cavities, but readily use a man-made nest box. Depending on latitude and elevation, Screech-Owls begin nesting in late winter to early spring. The best chance of attracting a nesting pair, is putting up a nest box before mating season. Happy Birdfeeding!